GitHub - uzhdag/pathpy: An OpenSource python package for the analysis of time series data on networks using higher-order and multi-order graphical models. Want to be notified of new releases in uzhdag/pathpy? pathpy is an OpenSource python package for the analysis of time series data on networks using higher- and multi-order network models. pathpy is specifically tailored to analyse temporal networks as well as time series and sequence data that capture multiple short, independent paths observed in an underlying graph or network. Examples for data that can be analysed with pathpy include time-stamped social networks, user click streams in information networks, biological pathways, citation networks, or information cascades in social networks. Unifying the modelling and analysis of path statistics and temporal networks, pathpy provides efficient methods to extract causal or time-respecting paths from time-stamped network data. The current package distributed via the PyPI name pathpy2 supersedes the packages pyTempnets as well as version 1.0 of pathpy. pathpy facilitates the analysis of temporal correlations in time series data on networks. It uses a principled model selection technique to infer higher-order graphical representations that capture both topological and temporal characteristics. It specifically allows to answer the question when a network abstraction of time series data is justified and when higher-order network representations are needed. pathpy facilitates the analysis of temporal correlations in time series data on networks. It uses model selection and statistical learning to generate optimal higher- and multi-order models that capture both topological and temporal characteristics. It can help to answer the important question when a network abstraction of complex systems is justified and when higher-order representations are needed instead. 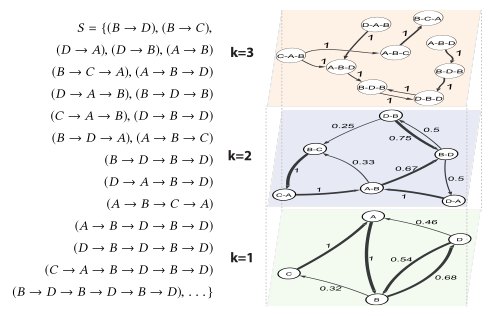 pathpy extends higher-order modelling approaches towards multi-order models for paths that capture temporal correlations at multiple length scales simultaneously. All mathematical details of the framework can be found in this openly available preprint. A broader view on optimal higher-order models in the analyis of complex systems can be found here. pathpy is fully integrated with jupyter, providing rich and interactive in-line visualisations of networks, temporal networks, higher-, and multi-order models. Visualisations can be exported to HTML5 files that can be shared and published onthe Web. Please make sure that you use the pyPI name pathpy2 as the package name pathpy is currently blocked. A comprehensive 3 hour hands-on tutorial that shows how you can use pathpy to analyse data on pathways and temporal networks is available online. The first public beta release of pathpy (released February 17 2017) is v1.0-beta. Following versions are named MAJOR.MINOR.PATCH according to semantic versioning. The latest release version is 2.0.0. Depending on whether or not scipy has been compiled with MKL or openblas, considerable numerical differences can occur, e.g. for eigenvalue centralities, PageRank, spectral clustering, and other measures that depend on the eigenvectors and eigenvalues of matrices. Please refer to scipy.show_config() to show compilation flags. We are investigating this issue. Interactive visualisations in jupyter are currently only supported for juypter notebooks, stand-alone HTML files, and the jupyter display integrated in IDEs like Visual Studio Code (which we highly recommend to work with pathpy). Due to its new widget mechanism, interactive d3js visualizations are currently not available for jupyterLab. Due to the complex document object model generated by jupyter notebooks, visualization performance is best in stand-alone HTML files and in Visual Studio Code. The visualisation module currently does not support the drawing of edge arrows for temporal networks with directed edges. However, a powerful templating mechanism is available to support custom interactive and dynamic visualisations both for static and temporal networks. The visualisation of paths in terms of alluvial diagrams within jupyter is currently unstable. This is due to the asynchronous loading of external scripts and possible network latencies e.g. in wireless networks. We will replace this in a future version. The research and development behind pathpy is generously funded by the Swiss National Science Foundation via grant 176938. The research behind this data analytics package was previously funded by the Swiss State Secretariate for Education, Research and Innovation via grant C14.0036. The development of the predecessor package pyTempNets was supported by the MTEC Foundation in the context of the project "The Influence of Interaction Patterns on Success in Socio-Technical Systems: From Theory to Practice". pathpy is licensed under the GNU Affero General Public License.